Right now, you’re probably thinking about getting an airless paint sprayer. Yes, you’ve completed the structure of your project, you’ve built everything that needs to be built. Be it a piece of furniture, like a chair, a table, shelf, or even a building. Now, you think it’s time to add color to it and beautify it. Adding color means you have to paint it, and painting it means you either have to spray paint it or use a brush and roller. These are the two choices you’ve got at this stage of your project. The fact that you’re here on this page shows that you’ve made the right decision of spray painting instead of using a brush and roller which obviously takes a lot of time and energy. Apart from saving your precious time and energy, spray painting also produces far better and smoother finishes than a brush and roller will ever produce. So, without any further ado, allow me to present to you, the top 10 best airless paint sprayers out there which you can use to add color to your project or work. The following comparison table should be very helpful if you want to make a quick decision. If you’re DIYer, hobbyist or even a professional handyman, and you think it’s time to drop the brush and roller and upgrade to a time saving airless paint sprayer to handle your painting projects, then you should consider getting the Graco X7 airless paint sprayer. With the Graco X7, you have the capacity to add perfect and even coats of paint to your indoor and outdoor projects, including fences, decks and furniture. The Graco X7 is equipped with a pump which is capable of spraying up to a maximum pressure of 3000 PSI and can be adjusted according to your needs. The whole unit is powered by a 5/8 hp universal pump which performs excellently on standby to help you add color to your projects. In terms of performance, the Graco X7 is capable of spraying up to .31 gallons of paint per minute and is able to spray 125 gallons per year. With proper maintenance though, you can exceed those figures pretty quickly with your sprayer still going strong as new. The Graco X7 comes equipped with a metal SG2 spray gun in combination with a 515 RAC (Reverse-A-Clean) spray tip which makes it very easy to clean up the spray tip when it’s clogged by simply reversing it. With an easy pressure adjustment dial, you dial the pressure of the pump so you can spray different kinds of paint with the Graco X7 airless paint sprayer and achieve the finish you desire. The Graco X7 comes with a 25 ft paint hose for your use, though it can support up to 100 ft of paint hose so you can reach higher and cover a wide area while you paint without moving the unit itself. A mobile cart with tires makes it easy for you to transport the Graco X7 easily while you work with the unit. The Graco X7 is definitely one of the best when talking about airless paint sprayers. With the unit, you can spray a wide variety of paints and stain, both thinned and unthinned paint. You can even spray latex paints with it. The RAC spray tip really makes things easy when spray painting with the unit because, with the tip, you get to easily clear up clogs easily by simply reversing it and moving on with your painting. Even if you’re a professional painter who plan to use the X7 regularly, you’ll still get a decent run time from it with proper maintenance. Always purge it out after use to keep the unit in tip-top condition. The hose that comes with it is a little bit stiff and uneasy to work with. However, the Graco X7 airless paint sprayer unit itself works very well. If you care to afford a better hose, you’ll definitely find it easier handling and maneuvering the spray gun. 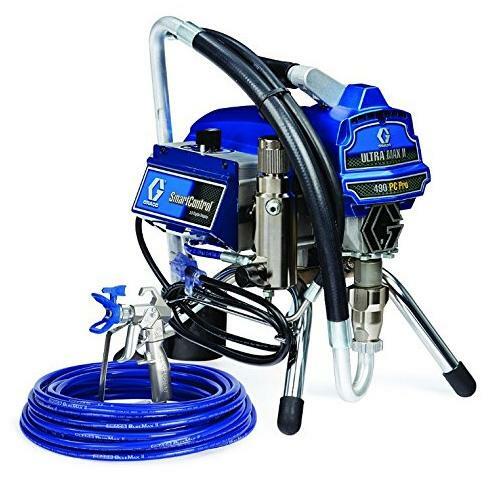 If you’re a remodeler, professional contractor, or painter who’s looking for a commercial grade top-quality airless paint sprayer, the Graco Pro210es will suit you just fine. The Graco Pro210es is equipped with a 1 hp Dura DC motor that can spray up to .47 gallons of paint per minute and 1500 per year. Now if that is not a commercially grade airless paint sprayer, I don’t know what is. It’s the type of paint sprayer that you can take from jobsite to jobsite, helping you to deliver even coats of paint continuously and still performing at its best. It comes with a 50 ft hose, but it can support up to 200 ft of hose length, so that you can cover a wide area without moving the unit itself. 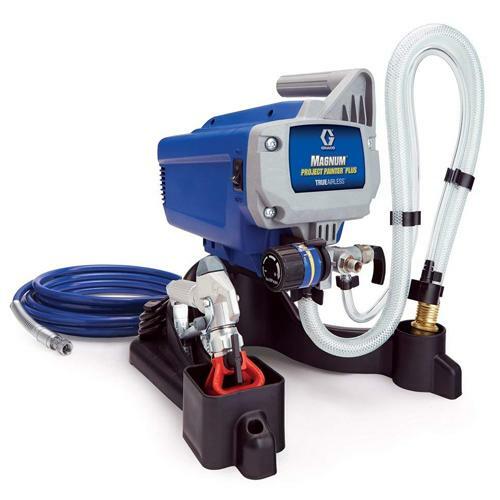 The Graco Pro210es airless paint sprayer can be dialed up to a maximum pressure of 3000 PSI, supports spray tips up to 0.021 inch in size, and as a result can be used to spray heavier paints easily. It’s equipped with an endurance pump which not only enables it to support that 0.021 inch spray tip, but also ensures that the paint sprayer will not give up the ghost sooner than you expect. Also included in the box, is an SG3 metal spray gun, a 515 spray tip and a quick guide to help you get rolling with your new airless paint sprayer. Rest assured, you can spray different types of paint such as heavy latex paints and hot solvents with the Graco Pro210es. The Graco Pro210es is a workhorse. It will definitely keep up with you as long as you can. It will definitely hold its own on a busy day in the jobsite. I like the versatility. You can really spray different kinds of paints with it comfortable. In terms of portability, it’s right there. It comes with a chrome plated steel cart with large pneumatic tires which you can use to move it easily wherever you want it. Also, the telescoping handle makes it really compact and easy to stow away when not in use. Like I said earlier, if you’re a contractor or remodeler who’s in need of a commercial grade paint sprayer, the Graco Pro210es will definitely meet your expectations. I don’t think there’s much to improve about the Graco Pro210es. I think the unit really performs very well, and it will definitely serve a long time. The Goplus airless paint sprayer employs a 3000 PSI fully adjustable piston pump to provide the suction pressure needed to power through your painting projects. If you’re in need of a good airless paint sprayer, choosing the Goplus airless paint sprayer would definitely produce the satisfaction you desire. It’s equipped with a 5/8 hp motor which powers the high pressure piston pump for the paint sprayer to work. You can paint anything both inside and around your home with it, including fences, decks, boats, interior walls, ceilings and exterior walls. It’s equipped with a 25 ft hose which is just enough to reach or the nook and crannies of any room you intend to paint and is able to cover a wide area in case you’re paint outdoor projects like your fence. If you have to move the unit while paint, you can easily do that because it’s very lightweight and compact. Cleanup after use is never a big deal. All you have to do is run clean water or solvent through the unit depending on the type of paint you used until a clear solution of water or solvent comes out through the spray gun. The unit is very DIYer friendly. You don’t have to be a professional painter before you can get up to speed with it. Just make sure to read the instructions and manuals for the manufacturer that comes with it. Get it assembled and you’ll be up and running in no time. It tends to overspray to some extent, which actually makes you use more paint than necessary. This is common in almost any paint sprayer though. Additionally, the time saved compared to when using a brush and roller more than compensates for the little oversprayed paint. Talking about airless paint sprayers, you can ask any professional painter you know, Graco arguably produces some of the best ones. With the Graco X5, they offer a more budget friendly airless paint sprayer for you if you just don’t dig the X7 because due to the price. The Graco X5 is really geared towards users like homeowners and DIYers who don’t spray consistently throughout the year. If you paint, maybe ones a month or ones in two months, the X5 is for you. It offers you the capacity to spray up to .27 gallons of paint per minute and 125 gallons per year. You can actually do more than that figure for you if you take care of the tool. You know as they say. You take care of your tool, it will take care of you. The X5 is equipped with a stainless steel piston pump which is powered by a ½ hp universal motor to provide the performance you need to carry out all your spray painting projects as a home owner, DIYer or even a handyman. It can handle a pressure of 3000 PSI which can easily be adjusted according to your needs just like the Gracos we’ve reviewed before, making it very suitable for spraying different types of paint, even heavy unthinned ones. With a weight of just 13.3 lbs, it’s very lightweight and very easy to carry around when carrying out your projects. It’s also equipped with a RAC spray tip which makes it easy for you to unclog while you’re painting with it by simply reversing the tip to spray through the other side. The Graco X5 airless paint sprayer gives users a more budget friendly high performance airless paint sprayer which can be used to handle both interior and exterior painting projects. It has the capacity to handle a hose length of 75 ft, though it comes with a 25 ft long hose when you purchase it. The sprayer is very easy to setup up even if you’ve not used a paint sprayer before. Just make sure to read the instructions or guide and you’ll be on your way to having, maybe the best painting experience of your life. It’s definitely DIYer friendly, as it is very light and compact compared to other sprayers. You can spray different types of paint through it easily, even thick latex paints without a moment’s thought. It’s what the X5 airless paint sprayer is built to handle. With the Graco X5 airless paint sprayer, you get a budget friendly top-end airless paint sprayer you can use to meet your painting needs, and deliver a professional touch to your home without expending so much effort. In terms of performance, the Graco X5 performs extremely well. The only caveat is that it takes a little time to clean up the unit after working with it, which is very necessary in order to keep your paint sprayer in good working condition. If you’re a DIYer or home owner who’s not used a paint sprayer before, the Graco Project Painter Plus will not only help you to gain the experience of using a paint sprayer, but it will also help you achieve fine paint finishes which you cannot achieve with a brush and roller. With the rate at which you can spray with it, you also get to save a lot of time as the paint sprayer covers more area than when using a brush and roller to paint. Although the pressure can be adjusted per your needs, the Graco Project Painter Plus can spray up to a maximum pressure of 2800 PSI to help you achieve the finest paint coat you desire. The Graco Project Painter Plus is a high performance DIY friendly airless paint sprayer that is capable of .24 gallons of paint per minute and 50 gallons of paint per year. It’s not a paint sprayer you should demand a lot of use from, like every day use, but it will certainly serve you very well if you don’t carry out a lot of painting projects per month. The 3/8 hp universal motor which the sprayer is equipped with, coupled with the stainless steel piston pump ensures you can spray even heavy paint liquids with the Project Painter Plus airless air compressor. To make it easier to clean up like the other Graco airless paint sprayers, it’s also equipped with a RAC spray tips to make quick work of clearing up clogged spray tips during usage by simple reversing the tip. Painting with the Graco Project Painter Plus is very easy as you can spray directly from the spray gallon, which actually saves a lot of time. The sprayer is also very lightweight and compact. If you have to carry it along with you, you’ll have no problem doing so. The Project Painter Plus uses a little bit more paint more than when you’re using a brush and roller due to overspray and some paint remaining in the pipe which you have to flush out after you’re through with your painting. If what you’re painting is small, the wasted paint becomes quite obvious or noticeable. However, if you’re painting a large area, the wasted paint is negligible, plus you got to do it in a fraction of the time. I think that’s why you need an airless paint sprayer in the first place, because it helps you carry out your painting projects quickly without wasting time, though you may waste some of your paint. 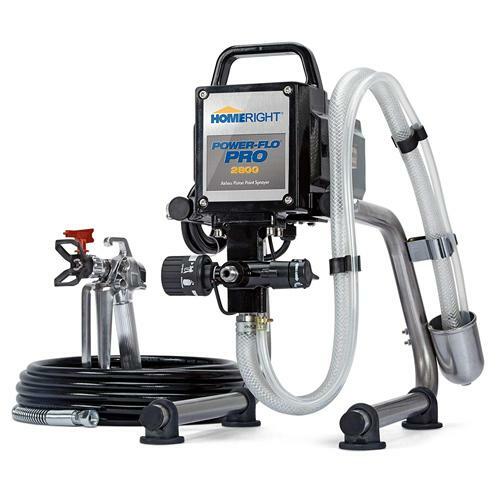 When looking for an airless paint sprayer, be sure to check out the HomeRight Power Flow Pro, because it’s another great option you can use to achieve professional looking painting results as a homeowner or DIYer. It comes equipped with a ½ hp motor and a pump which can generate up to 2800 PSI of pressure to spray both thinned and unthinned paint easily. With the unit in hand, you don’t have to do anything tricky to start painting with it. It comes with a suction tube that you can introduce directly into your 1 gallon or 5 gallon paint bucket and start spraying with it immediately. You can spray a wide variety of paint with it, depending on what your project requires. You can spray thick emulsion latex paints, oil based paints and stains with it easily. Adjusting the pressure to suit the type of paint and to customize paint flow can also be done easily by the simple turn of the pressure dial. The pressure adjustment dial will also come handy to reduce overspray when spraying with the spray gun. Assembling the spray gun is also very easy. Just make sure to read the manual that comes with it and follow the instructions for assembly. The spray gun comes with a reversible tip which is very useful for clearing the clogs which are quite inevitable when using spray guns. If the tip clogs, you can simple clear it by reversing it, and spraying through the other direction to clear the clogged tip. Overall, the Homeright Power Flow Pro definitely makes the cut when talking about the best airless paint sprayers. It’s a great budget friendly option you must consider if you’re a home owner looking for a power tool like this to make your painting projects a breeze. Painting with the Homeright Power Flow Pro is very easy and fast. All you have to do is make sure you set it up properly according to the instructions from Homeright. After working with it, cleaning it up is also very easy. All you have to do is run a clear solution of water or solvent for oil based paint through the paint sprayer until the paint is totally washed out and a clear solution comes out through the spray gun. However, you should completely disassemble and clean parts separately if you have to stow it away for a long time. The sprayer performs better with lighter paint, and slows down with thicker paint. It could use a bit more power/pressure. 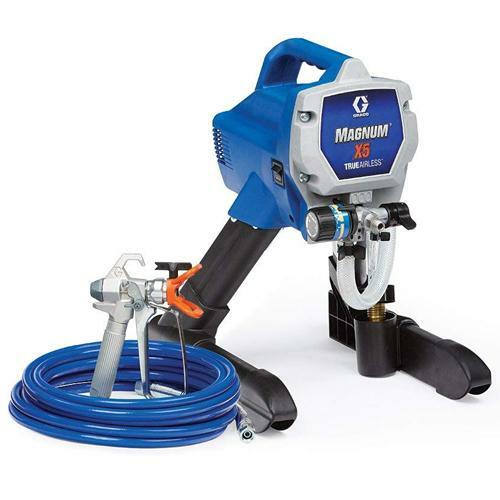 The Graco Ultra Max II 490 is an electric airless paint sprayer designed for professional painters, remodelers and contractors who needs a paint sprayer that will stand up to demanding, daily use in the job site or for painting residential buildings. This is not a toy. It’s the real deal. It comes with a smart control feature which consist of a digital display and button that provides stats such as the pressure at which the unit is working, the gallons of paint pumped and even the time. It’s a very handy feature that will help you to know the condition of your unit and aids proper maintenance. The Graco Ultra Max II 490 uses an endurance pump which is capable of pumping fluids up to a maximum pressure of 3300 PSI, hence it’s capable of pumping heaving painting materials easily even without thinning. It’s also equipped with a brushless DC motor which is very good as it produces higher torque which results in more work. Brushless motors are lasts longer and are easier to maintain due to the fact that they don’t use brushes, hence you don’t have to change them. When you get the Graco Ultra Max II 490, you’ll discover that it runs very quietly. If you’ve used other airless paint sprayers before, you’ll quickly notice this. Graco was able to achieve this by using harden steel gears for power transmission in the unit, which are set to slow down the pump stroking, and ultimately reduce noise and vibration. Accessories that come with the unit include a contractor gun, a reverse-a-clean (RAC) spray tip, and a 50 ft Bluemax airless hose. 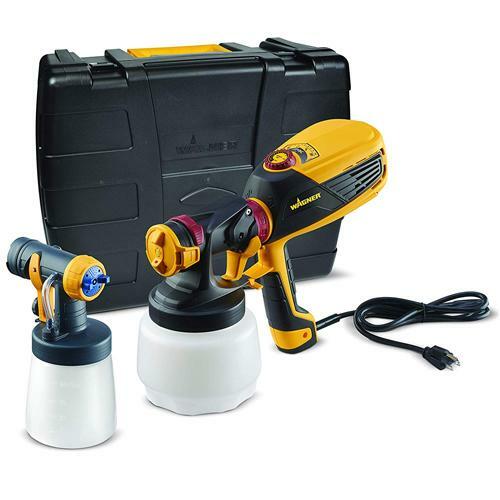 If you’re are a professional painter who’s looking for an airless paint sprayer that will deliver professional results, you’re currently reading about it right now. Power is not something that’s lacking with the Graco Ultra Max II 490. The combination of the 1 hp brushless DC motor and the endurance pump helps propel thick unthinned fluids at very high pressures through the hose and paint gun to achieve the best layer of paint coat for your project. One thing I also like about the Ultra Max II is that it’s very easy to clean up after use. Graco implemented fast flush high-flow cleaning system that really makes flushing out paint remnants after using the unit a breeze. The Graco Ultra Max II 490 performs very well. The only caveat is that it’s a little bit on the pricey end. If you’re a professional who use it on a regular basis, the price should not be a concern though, as it will cover its cost in no time. Another budget friendly option in the pool of the best airless paint sprayers is the Titan ControlMax 1500. 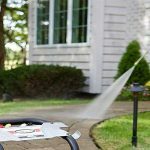 It’s one of the best airless paint sprayers for homeowners and hobbyist, which you can use to complete your interior and exterior painting projects in a fraction of the time. For a paint sprayer to work, the unit has to atomize the paint fluid into tiny particles at the spray tip in order to distribute the paint over the surface you’re trying to paint over. This makes spray painting possible, but it also results in one problem common with all paint sprayers, that is overspray. To combat the problem, the Titan ControlMax uses HEA’s new tip technology to greatly reduce overspray by 55 percent and save your paint from being wasted and allowing you to cover more area with the paint you have in hand. It can spray paint up to a maximum pressure of 1500 PSI, and it’s equipped with a 25 ft hose to achieve a greater reach. 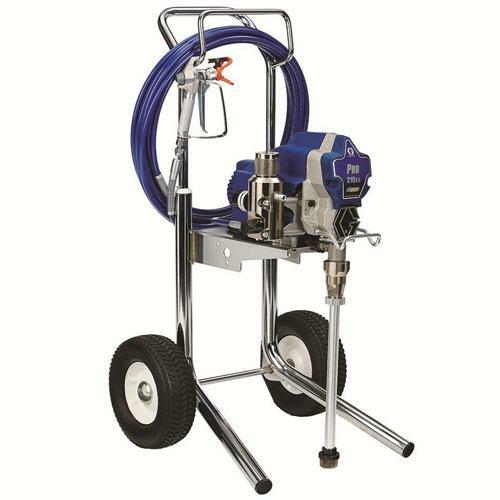 The Titan ControlMax can spray up to 0.29 gallons per minute using a 515 tip, and can handle a maximum hose length of 75 ft to help you keep the unit in one place while spraying with the spray gun. Though the Titan ControlMax cannot standup to consistent jobsite use, but it will certainly hold up for a long time for any form of home or DIY use. 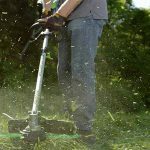 Like the other paint sprayers in this review, the Titan ControlMax can really shortens the time you spend for any spray painting project you embark on. I really like it because it’s really budget friendly, you don’t have to lose an arm and leg to get it. Setup is quite easy and cleanup after use is straightforward. Make sure to read the user manual/instructions and you’ll be good to go. The sprayer could use a longer hose. 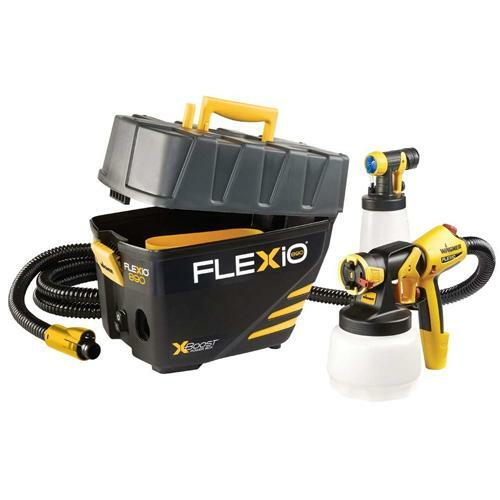 The Wagner Flexio 890 is another paint sprayer you can use to complete your painting projects by yourself as a homeowner. It is not actually an airless paint sprayer, but it works in a similar way. It consist of a cup spray gun for atomizing the paint and storage case which houses a turbine for pumping the paint. With the Wagner Flexio 890, you can spray stains, latex and oil based paints easily, you can spray interior and exterior walls, fence and decks to achieve the professional finish you desire. 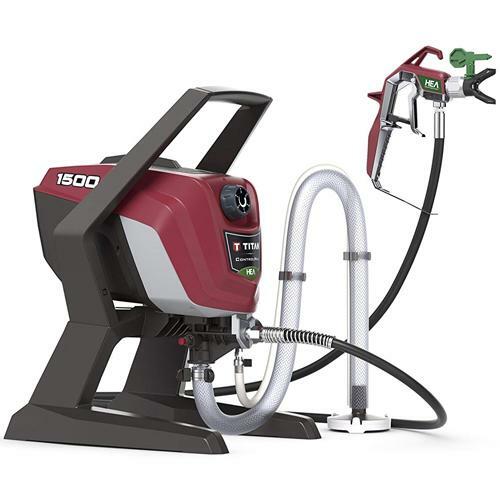 It comes equipped with an 11-1/2 ft hose which connects the turbine and the spray gun together, helping to transmit paint fluid to the spray gun. The Wagner Flexio 890 comes with two nozzles for spraying different types of materials. It comes with an iSpray nozzle for spraying unthinned paint, and a detail finish nozzle for spraying projects which require a very fine finish. The iSpray nozzle can be adjusted to spray different types of patterns with the spray gun including horizontal, vertical, thin and wide patterns easily. Having the Wagner Flexio 890 in your tool arsenal will is a sure step that will definitely help you get the best results from your painting projects. In terms of performance, the Wagner Flexio really does the job of spraying the paint effectively, and you can spray different types of paint and stains with it. I like the storage that comes with it. Every accessory including the spray nozzle fits into it and makes stowing it very easy. 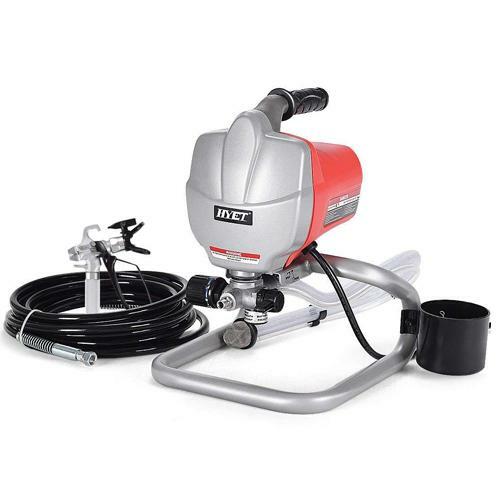 It’s also one of the most budget friendly paint sprayer you can ever get your hands on. So, if you’re a little bit tight on your budget, you should consider getting the Wagner Flexio 890 for that painting project you want to carry out. Although it’s not very heavy to move, you have to move the unit along with you all the time, because the hose is just 11-1/2 ft which is quite short. The extension is also about 2 ft long which is also short. So, moving the unit while painting a large area is inevitable. However, the unit itself performs well. As always, make sure to read the manual and operation instructions from the manufacturer in order to get the best out of it. Without reading and following the instructions, you might actually not get it to work the way it’s supposed to. The Flexio 590 is another Wagner paint sprayer that houses an X-boost turbine, iSpray nozzle, and a detailed finish nozzle all in one handheld kit to power through your painting projects. Like the Wagner Flexio 890, it's also not an airless paint sprayer, but it performs similarly as well. It weighs only about 4 lbs which is very lightweight and easy to handle through long spray painting projects. You can spray a wide variety of paints with it including thinned and unthinned latex paints and even stains with it. The X-boost turbine has a dial which can be used to adjust the air pressure and intensity of the sprayer according to the type of paint you’re spraying with it. If you’re spraying transparent or semi-transparent stains, you’d want to dial it to 3, while for 4-7 is for spraying solid stains and latex paints. For thick latex paints and primers, you’d want to keep it at 7. Equipped with the Wagner Flexio 590 and keeping the above settings in mind, you’d be able to breeze through your spray painting projects quickly and easily. As always, always follow the user manual and instruction to achieve a better performance and a longer tool life. The Wagner Flexio 590 is a very compact paint sprayer. It’s just 4 lbs heavy, so you don’t have to deal with a lot of weight, and you don’t have to deal with hose. It’s very budget friendly, so you can get still get it if you don’t want to spend a lot on a paint sprayer. Performance is great as long as you go with the instructions that come with it from Wagner. Though it’s not a big deal, but you have to keep refilling the paint cup with every 4 minutes or so, which adds up to a bit of downtime, which is not so for the airless paint sprayers in this article which have inlet valves that connects directly to the paint gallon. I like what you said about using a paint sprayer as opposed to using a brush, which takes a lot of time and energy. I think that paint sprayers are essential to covering large surface areas in short amounts of time. 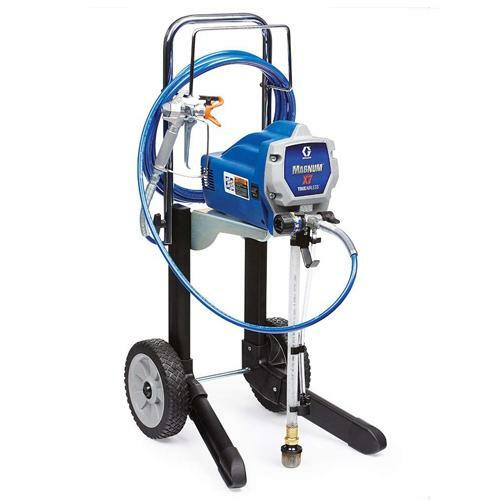 If I were to need a commercial paint sprayer, I would go with one of the Graco paint sprayers. Nice tips on choosing a paint sprayer. I’m kind of torn between the Graco X7 and the X5. What are your thoughts? Hey thanks for stopping by. The X7 and the X5 are more like the different sides of the same coin, since they’re produced by the same manufacturer-Graco. However, though both can be used commercially, the X7 is more commercial duty airless paint sprayer than the X5, since it can spray more paint per minute and is able to handle a longer hose than the X5. So, if it’s for your personal DIY projects, you can’t go wrong with either of the two. Or you can decide to go with the X5 since it’s more budget friendly. Both can handle commercial work, but the X7 will obviously perform better. The mobile cart it comes with also makes working with it much easier.